Two years ago, They designed a community of villas and apartments serviced by world-class amenities, a secure, relaxing, luxurious environment created for people who expect the very best. Today, their dream is a reality, and they proudly present a rare and exceptional development which you can make your home. In these pages, you will learn more about Eighteen Islamabad, marvel at the contemporary architecture set around a championship golf course, and better understand how this exclusive, coveted lifestyle can be yours. 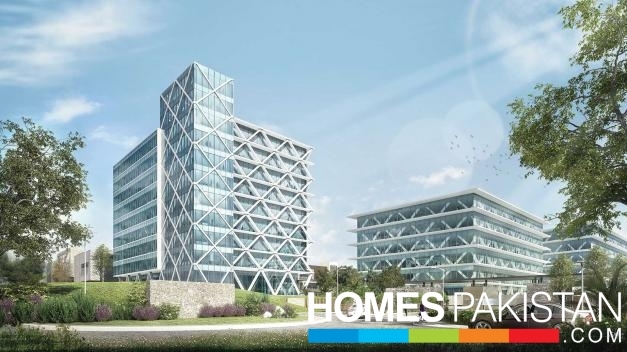 The Core is the city of Islamabad’s latest and most high-tech offering for commercial tenants. Housed in 13 unique buildings, the design of this business centre reflects local culture and architecture while delivering the very latest in modern office amenities. The Core also enjoys an exceptional location ten minutes from the new international airport and just 20 minutes from downtown – perfect for local companies wanting international access, or for international corporations desiring the ultimate modern base in Pakistan. The heartbeat of Eighteen Islamabad is the Club, a modernist masterpiece with a central location overlooking the 18 hole championship course. The Club is the home of golf at Eighteen and will also be the social and entertainment hub of the development. Beautifully situated to be both convenient and to take advantage of the very best views of the lakes and fairways at Eighteen, it is a favorite spot for gourmet dining, drinks at sunset on the rooftop terrace, a range of leisure activities, or simply as a place to relax, unwind, and connect with friends. Because the Club was created from locally sourced materials, it harmonizes perfectly with the surrounding landscape while providing everything an amateur or professional golfer may want. Exceptional sporting facilities include a cricket pitch, squash courts, a sports hall, swimming pool, pro shop, yoga studio and a cigar lounge. 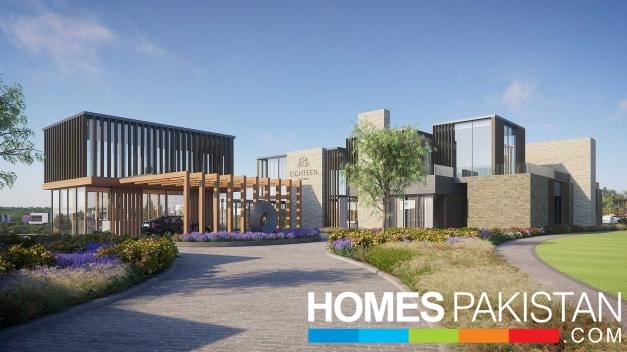 The Square at Eighteen provides residents and visitors alike with exclusive high-end shopping and dining centred around a welcoming, open-air square. The selection of stores and restaurants has been curated to provide options for a range of tastes and needs, from exclusive fashion retailers to those catering to more everyday purchases, from full-service gourmet dining to casual spots for drinks or coffee. Split over three levels, The Square is the perfect spot for couples and families to dine, shop, or take a relaxing stroll, and a dedicated entrance from the highway allows easy access for Islamabad shoppers. The Resort at Eighteen offers the same exceptionally high standards that Eighteen residents enjoy, presented in a five-star boutique hotel. Limited to just 150 rooms, it provides the privacy and seamless, personal service expected from the world’s finest hoteliers. With a spa, gym facilities, extraordinary dining options and an event space capable of hosting and catering 1,000 guests, The Resort at Eighteen is unlike any other facility in Islamabad. The Clinic offers Eighteen Islamabad residents both emergency and non-emergency medical facilities onsite and just moments away from their homes. With a fully equipped A&E unit, inpatient and outpatient wards, and a wide array of specialists, The Clinic is prepared to handle all medical issues directly within the development.